VietNamNet Bridge – Trung Nguyen, the Vietnamese coffee brand, has affirmed that Trung Nguyen coffee products have been more favored in Vietnam than Nestle products. Meanwhile, the foreign giant has denied this. 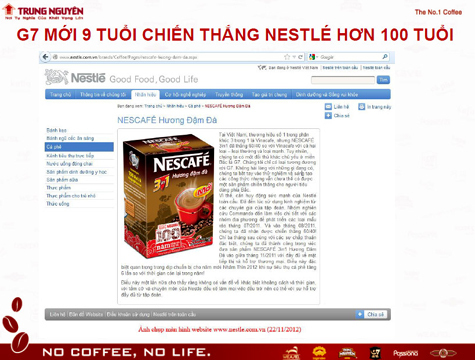 On the Creative Day for Vietnamese aspiration held in HCM City on November 23, 2012, the Trung Nguyen Group made public an analysis about its G7 instant coffee product and a screenshot image from Nestle’s website, with the caption: “G7 moi 9 tuoi thang Nestle 100 tuoi” (the 9-year-old G7 wins over the 100-year-old Nestle). The information on Nestle’s website, according to Giao duc Vietnam newspaper, was not found on the website on November 27, because it has been removed. In reply, a representative of Nestle affirmed that this was just distorted information, because the image did not mean the victory of anyone over the other. The representative also refused to make comments about the statement by Trung Nguyen. Nine years ago, on November 23, 2003, Trung Nguyen organized a blind taste- test, which gathered 11,000 participants. 89 percent of them chose G7 and only 11 percent chose Nestcafe of Nestle. Citing the result of the test, Trung Nguyen came to conclusion G7 has become the Number 1 in the instant coffee market in Vietnam in terms of market share, sales and output. This was then described as a victory of David against Goliath. Meanwhile, Nestle kept calm about the conclusion, saying that Nestle would never make comments about the quality and positioning of its rivals. The representative of Trung Nguyen, citing the Article No. 123 of the 2005 Commercial Law, said that Trung Nguyen violated the law which prohibits businessmen compare their products with the products of other businessmen. Pham Thi Diep Giang, Communication Deputy Director of Trung Nguyen, argued that the blind taste-test was held on November 23, 2003. At that time, the Article No. 123 did not exist. Therefore, no one could say Trung Nguyen violated the law. In response, Nestle cited the provisions of the 1997 Commercial Law, which took effects before the day the test was held. Vietnamese experts have refused to say about the quality of Nestcafe of Nestle and G7 of Trung Nguyen. However, they believe that Trung Nguyen did not “play fair” when speaking scornfully of the products of its rivals. Dao Xuan Hoi, a lecturer of the University of Labor and Social Affairs, affirmed that Trung Nguyen has violated the Vietnamese laws which say that one must not libel others’ products to dignify his products. Hoi has also pointed out a problem here --that Trung Nguyen re-used the result of a test conducted in 2003, or nine years ago, in a document delivered at a workshop taking place in 2012. In fact, Trung Nguyen once had arguments with AC Nielsen, a market survey firm, on the “number 1” position on the Vietnamese instant coffee market. In response to the Trung Nguyen’s statement that G7 is the Number 1 real instant coffee in Vietnam, AC Nielsen argued that G7 only leads in 3-in-1 market segment. Meanwhile, the instant coffee market comprises of 3-in-1 and 2-in-1.